Could your green juice do you harm? Here’s how to ensure you’re making a healthy, low sugar green juice. For me, fresh green juice is one of life’s little pleasures. (Cleaning the juicer is another story, of course.) Its taste is revitalizing, and I love the knowledge that when I drink green juice, I’m getting some intensely concentrated and readily absorbable nutrients in one twelve-ounce glass. The juicing craze makes perfect sense to me—aside from its taste and known nutritional value, green juice imparts its own special aura (dare I say mythos?). It’s easy to feel that our juice is more than a “healthy drink.” It’s an elixir—our one-stop-shop to free our bodies of lurking toxins and banish the remnants of that weekend with the exotic pink drinks. I’m not here to refute any of the lore we wrap around our favorite juices. There is room in my heart (and mind!) to believe all of the wonderful things we hear about fresh green juice. Indeed—it’s an excellent way to consume a high concentration of raw nutrients that may equal a heaping plateful of veggies and fruit. The natural, simple sugars in juice are also a good source of fuel for the body—especially immediately post-workout—which would explain why drinking fresh juice feels so energizing. Juicing can even help you sneak in veggies you wouldn’t normally consume raw—or otherwise. Juicing is about the only way you’ll see me consume cucumber! Lately, however, I’ve been coming across articles that suggest that freshly juiced juice can actually do harm. In fact, one source claims that fruit juice could be as bad for your liver as alcohol! Blasphemy! But really—could this be true? Fruit juice—whether it’s freshly squeezed or prepackaged—contains a serious dose of natural sugar—even when there is no sugar added. Without the fiber of the whole fruit, all of that sugar gets into our system fast; and even though the sugar is natural, it’s still sugar, and too much of it can cause a big spike in blood sugar, which is something to avoid, especially if you have sugar sensitivities, diabetes, or hypoglycemia. We often don’t realize that it takes several servings of fruit to make a regular-sized glass of juice. In other words, juice can be a very concentrated form of sugar. -If you’re adding fruit to your juice, limit yourself to the amount that you would eat in one sitting—like one apple, or one handful of pineapple chunks. The majority of your juice should come from low-sugar green veggies—like celery, cucumber, leafy greens, etc. -If you want to be extra careful with your fruit, go for low-glycemic fruits like green apples and berries. -Apply the first rule to sweet veggies, like beets and carrots. The sugar in these can add up, too, so stick to one serving. -Go bold and opt for a fruit-free juice (with the exception of lemon juice). Drink it “savory” or add a little stevia. -Alternate green juice with green smoothies—smoothies pack in a lot of fiber, so blood sugar spikes are less of an issue. -Drink your green juice when your body needs natural sugar the most—that is, after your workout! The simple sugars in fruit are just the thing when your body is restoring its glycogen reserves. 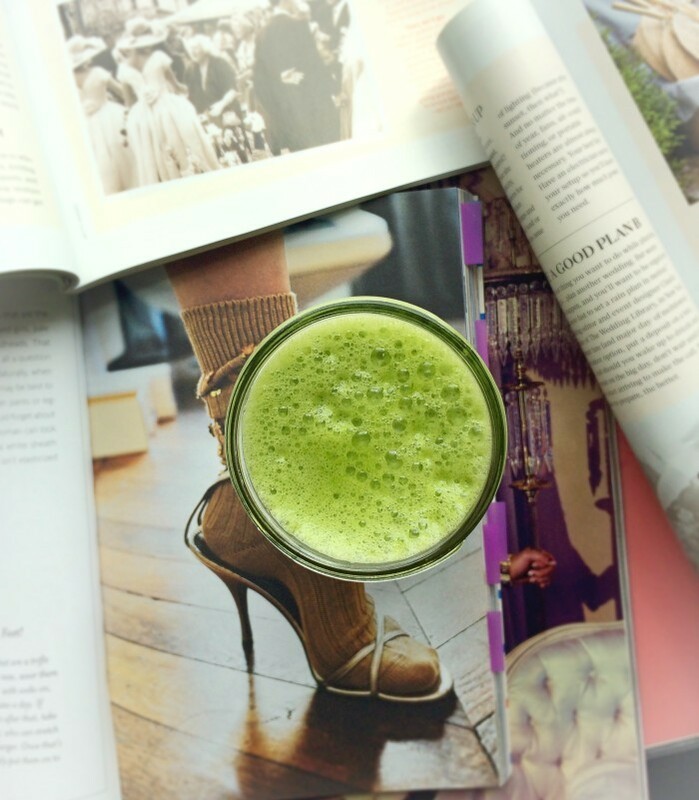 Now, let’s go embrace our green juice! What are your favorite juicing tips? i would have pegged you for a total cucumber lover!! i’m not a “cucumber person” or anything, but have a few dishes that I like if someone else makes them for me…cucumber kimchi (using kirby like small fat ones) is really delicious. Also Korean style cold cucumber soup with seaweed (that sounds gross when you say it like that…) is really refreshing. It’s like gazpacho!